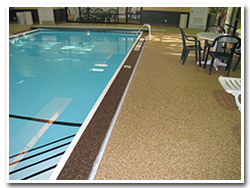 Nature Stone’s maximum strength, durability, longevity, and ease of maintenance make it the perfect solution for high-traffic areas such as the lobbies, entryways, and hallways of office buildings, hotels, or apartment complexes. It is a great choice for any public gathering or meeting space. Of course, you will also find Nature Stone flooring outdoors in highly trafficked areas such as pool decks or patios. Choose Nature Stone flooring for your high traffic space and never again spend valuable time and money repainting, re-carpeting, or repairing conventional floor coverings again! Schedule your free ￼in-home consultation today.